I was born in Mt. Lebanon Pennsylvania and after marriage, moved to Canonsburg in 1992. My sight was good all of my life until 1990. For many years my career as a graphic designer bloomed before noticing vision distortion and night-blindness. I was a self-taught artist when I was a young girl. My mother was an artist who excelled in oil paintings which inspired me to study under her. Having no patience with oils, I liked acrylics better. While in school, I explored other variety of arts, including macramé, rug hooking, weaving, stitchery, pottery, pastels, and, pen and ink. My mainstream was painting. In 1990, my brother and I both had minor accidents while driving. Our mother arranged an appointment with an eye specialist and we found that we both had Retinitis Pigmentosa (RP). In 1994, my mother passed away suddenly before she was able to schedule blood tests to see if she was a gene carrier. Like everyone else, my brother and I were told there is no cure. My sight remained stable for 10 years and I continued to work. Later my sight started failing quickly. Struggling at my job, I then found Blind & Vision Rehabilitation Services (BVRS). BVRS trained and supplied me with special computer software programs, magnifiers, and a Closed Circuit Television (CCTV) that extended my employment 5 more years. In 2012, after I departed the working world I lost my brother of 49 years. Being at my lowest point, I didn’t know how to spend the rest of my life. My husband, Melvin, and I traveled with our RV, fished, and played our accordions, but there was an empty space in me. After watching a television show in 2014 that featured blind artists, I told my husband I wanted to start painting again. He wasn’t sure how I could do this, but he thought we’ll give it a try. So for my birthday, he bought me a set of acrylic paints and a canvas. This is where “Lighthouse Cove” started. Melvin asked, “How did you do this”? I showed him my techniques – I outlined the special position of the object on my canvas using colored tape. Also, the brand of paint that I use never changed their color names. This enables me to know what color I want to use. It was a challenge for me so I kept on painting, painting, and painting. Eight pieces later, each piece was more difficult being harder to add clever details with my sight diminishing over time. Using hand-held magnifiers and my CCTV helps me achieve the details in my paintings. Helping others through my artwork was my vision, so I created a business called “BLT Art” for a Cause. I make and sell prints of my originals and donate a portion of the profits from every print sold to blind advocacy organizations, and research groups. A “Where’s Waldo” style creative touch in each of my pieces includes a hidden bear, lighthouse, and train. By doing this, it creates an eye awareness for those fully sighted, to appreciate being able to find these objects, versus those visually impaired who can’t. Many of the great advancements today wouldn’t be possible without doctors, scientists, and engineers with good sight. I devote most of my time serving the blind community. Currently, I am president of the local chapter of the Washington County Council of The Blind. In addition, I am active with Pennsylvania Council of the Blind’s (PCB) Vision Loss Resource Group. I have met a lot of people and learned from them on how to survive independently. There is so much to find and learn from a support group. I encourage folks to not let their disabilities get them down. “Where there’s a will, there’s a way.” Because you have a limitation doesn’t mean you can’t stop going. There is a talent in everyone…fulfill that dream! You can read more about me and view my artwork at bltart.com. If Diane’s name sounds familiar you may recall that she was recently featured in one of our local newspapers. She is also mentioned in a BBB article When We Connect We Are Stronger. 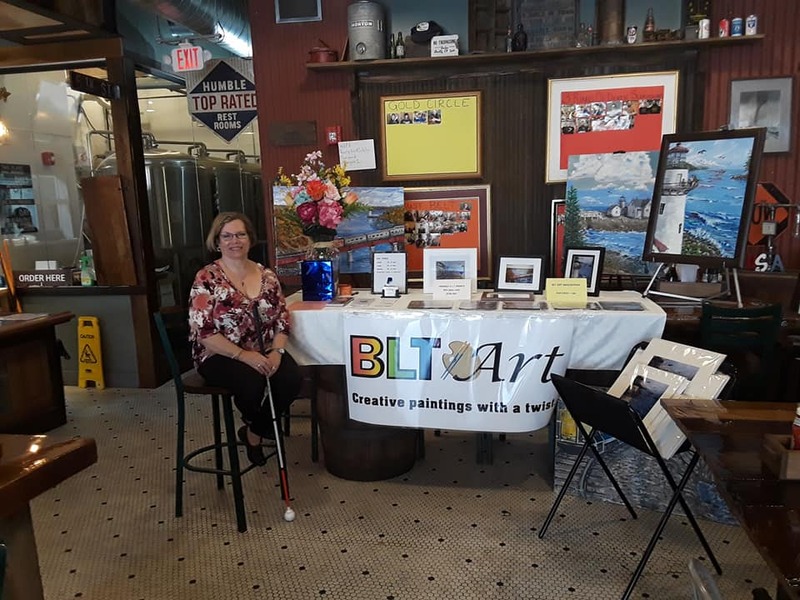 Diane is seated on a bar stool next to a table displaying her art at a show. She is wearing a floral v-neck top with black pants and is holding her white cane in front of her. Image 1: This photo shows how Diane begins painting a blank canvas. She has used blue and green tape to mark off the main areas of her painting. Image 2: This photo is near completion. Autumn foliage can be seen in the upper left corner and blue water in on the right. Bridge piers can be seen standing in the water. Strips of blue and green tape can be seen as guides to help Diane through her process. Thank you for reading and commenting Brigid. Diane continually proves no matter our circumstances, our talents will blossom when we are open to using a little creativity.